"Villa Fontana di Campo" was built in the eighteenth century for the processing of the marl stone that served exclusively to the construction of the Cathedral of Ribera. Around the middle of 1700, in fact, the church purchased the land where the villa stands now and built a factory used for processing of the marl, as testified in the notary deed exposed in the villa. Today, evidence of its original use, are part of a gear grinder used for the processing of stone and black and white photos depicting the old structure. Villa Fontana di Campo is located in a quiet countryside area but at the same time it’s located few minutes driving from the center of the town, so it is an ideal place for those in search of an oasis of peace, however, without staying too far from the town center and all amenities. 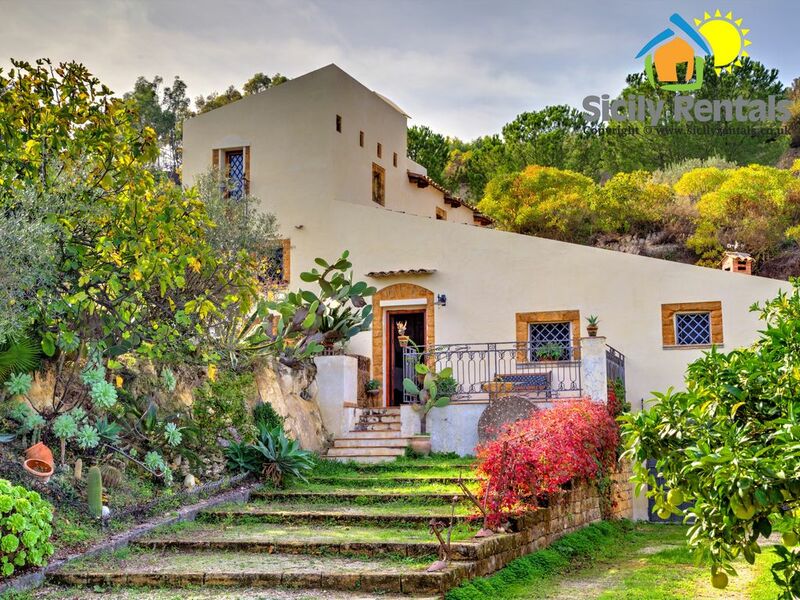 The strong point of the villa is the fantastic view of the Sicilian countryside enjoyable by the several outdoor spacess. 5000 square meters of local flora-rich soil is the framework for this very characteristic villa both for its history and the current design. The villa has three levels, each one accessible both from the outside and the inside. From the front porch you have access to the great hall whose arched openings create two rooms: a dining area and a living area with sofas and a fireplace. From this room you can reach the mezzanine floor where there are a bathroom with shower and a kitchen full of typical tools and a feature pantry area. The kitchen leads to a further veranda with table, chairs, stone bench, barbecue, sink and an old wood stove, all surrounded by a flourishing vegetation. Upstairs there is the night area, consisting of two large bedrooms and a bathroom with shower; both rooms have a double bed, one of them has also a mezzanine with a single bed. This last room has a large terrace with panoramic view. The villa is equipped with every comfort: free WiFi, private parking, automatic gate, very well-equipped kitchen, air-conditioned rooms. Moreover, it is just 10 minutes driving from heavenly beach places like the natural reserve Foce del fiume Platani. Emmanuel was a wonderful host and through a little crisis was really there for us. I can’t recommend this place highly enough. Villa was beautiful iand in a good position for visiting the sites in this part of Sicilly, and the host was friendly, helpful and accessible. The cleaning fees and Home and Away fees together made the total cost 28% more than the advertised nightly rate which made the whole deal quite expensive. We have used Owners Direct for many years and never had to pay a service fee and found it much easier then to deal with the owners directly. Our host was unaware of this extra fee that clients paid being added to advertised cost. We found this fee particularly galling as up until 12 hours before our departure we had no address for the villa and only found it out by chasing Home and Away who at one point told us they could do nothing about it until we arrived at the villa at 4pm ! Fantastic villa, beautiful scenery, brilliant location. A great find! The house is beautiful and so well equipped and spacious. We loved the views from the different terraces and the orange trees and olive trees. Everything went really smoothly and all communications were very clear and prompt. We loved the area, plenty to see with beautiful scenery. Urlaub pur. Man möchte einfach dort für immer bleiben. Sehr schöne und gepflegte Unterkunft. Im März war es sehr kühl, daher warme Kleidung für innen und außen nicht vergessen. Vom ersten Moment an fühlten wir uns sehr willkommen! Es fehlte uns an nichts, der Empfang war herzlich, die Vermieter sind unglaublich bemüht und hilfsbereit. Dafür unseren ganz besonderen Dank! Das Haus wurde sehr liebevoll wieder aufgebaut und ist heute ein Prachtstück. Wir haben unsere Woche hier sehr genossen. Lieber Emanuele, am liebsten erinnern wir uns an den Bootsausflug mit Dir!